A novel grapevine training system, semi-minimal-pruned hedge (SMPH), designed for mechanized pruning and harvesting was established on Sangiovese. The system was derived from adult spur-pruned cordon (SPC) vines that were modified to form a mechanically pruned hedge. SMPH heights of 80 cm and 120 cm were compared to SPC from 2005 to 2008, with an average of 332 and 479 buds per meter of row on SMPH 80 and 120, respectively, compared to 18 count nodes per meter of row on the hand-pruned SPC. The hedged vines had a larger leaf area, greater leaf area/crop ratio, and 35 to 40% yield increase compared to SPC, but there were no differences in juice soluble solids, pH, and acidity across the treatments. Berry skin anthocyanins were higher in hedged vines, notably the SMPH 120. The SMPH had more numerous but less compact and smaller clusters free of botrytis compared to SPC. While SMPH 120 showed a tendency to alternate bearing, this effect was minimal in SMPH 80. Single-shoot growth measured in 2006 was lower in SMPH vines, and total seasonal canopy light interception was higher compared to SPC vines. SMPH single-leaf assimilation was similar to SPC vines. Mechanical harvesting of both SMPH treatments was successful. These findings suggest that the two SMPH systems warrant further commercial evaluation because of their positive response to mechanization, grape yield, and quality and low susceptibility to bunch rot. Grapevine pruning is traditionally performed by hand during winter dormancy to remove most of the vegetative growth from the preceding year. It is designed to maintain vine shape and size, control bud number, retain the most potentially productive buds in optimal distribution, control shoot number and, hence, bunch number and size (Winkler et al. 1974). Winter pruning is costly, requiring from 70 to 100 hr/ha of human labor depending on training system (Baldini and Intrieri 2004), and usually removes up to 95% of year-old wood (Winkler et al. 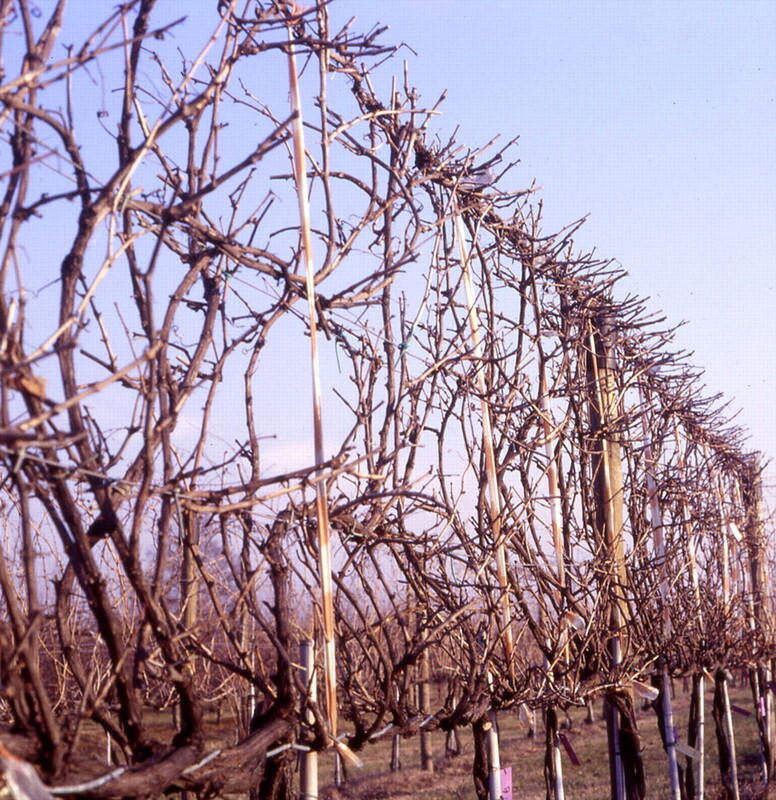 1974), leaving ~15 to 20 buds per linear meter of hedge wall (Intrieri and Filippetti 2001). Australian researchers devised an alternative technique in the 1980s labeled minimal pruning (MP), notable for its low pruning severity, rapid speed, and low cost (Clingeleffer 1983, 1984). Minimal pruning removes 10% or less of year-old wood (Clingeleffer 1988), thereby drastically curtailing labor demand to 5 to 10 hr/ha and leaving a bud number as high as 500 to 700/m of hedge wall. Minimal pruning has been used in the last 30 years in hot, dry Australian districts and in irrigated vineyards of premium cultivars like Riesling, Chardonnay, Shiraz, and Cabernet Sauvignon (Clingeleffer 1993, Possingham 1996). While MP is widely adopted, mechanical hedging ranging from moderate to heavy pruning severity is more widely practiced (Clingeleffer 2009a, 2009b). The results have been quite satisfactory in terms of crop yield and quality and, given the relatively small and loose bunches, even vine health (Clingeleffer and Possingham 1987, Possingham 1994, 1996, Clingeleffer 2009a, 2009b). However, MP trials in colder and wetter districts in Australia and the United States have shown that its success depends on more severe cuts and on post-berry-set mechanical crop thinning to limit yields and prevent delayed ripening and alternate bearing (Pool et al. 1993, Sommer and Clingeleffer 1993, Petri et al. 2003, Petri and Clingeleffer 2006, Clingeleffer 2009a, 2009b). Minimal pruning performance trials in France, Spain, and Germany have often delivered conflicting responses (Carbonneau 1991, Ollat et al. 1993, Martinez de Toda and Sancha 1998, Schultz et al. 1999). Generally, MP proved to be very sensitive to environmental conditions and management regimes and better adapted to warm climates and early- to midseason ripening varieties (Possingham 1996). That was also the core of Italian trial results, which were positive with MP on early ripening cultivars like Chardonnay (Iacono et al. 1998, Poni et al. 2000) but less than satisfactory on a mid- to late ripeners like Sangiovese in northern Italy (Intrieri et al. 2001). The latter investigation showed strong alternate bearing in MP vines, which doubled the yield/m with respect to control but exhibited a significant slowing in sugar accumulation (Intrieri et al. 2001). While MP showed signs of being a good approach to reduce costs and bunch rot in Sangiovese, it would have to be modified to reduce the negative impact of berry ripening rate. The idea was to revisit MP to develop a new training system. What has now come to be called semi-minimal-pruned hedge (SMPH) features a hedge shaped for a more severe mechanical pruning regime to reduce budload and alternate bearing. Accordingly, the purpose of the present study was to compare the yield components and grape quality of Sangiovese vines trained to SMPH at two canopy heights (80 cm and 120 cm) with Sangiovese vines trained to conventional spur-pruned cordon (SPC). The trial was conducted at the Experimental Station of the University of Bologna, Italy (44°30′N; 11°24′E), in a three-row vineyard of a nonirrigated, 11-year-old Sangiovese (Vitis vinifera L.) vines (clone 12 T) grafted to SO4 rootstock and trained to routine SPC, with cordon height 80 cm aboveground and vertically positioned shoots with three pair of evenly spaced foliage wires to ensure 120 cm of canopy height. Each row was 60 meters in length and the vines were spaced 1 m within the row and 3 m between rows. In 2002, three blocks of 18 vines were selected in the central row of the vineyard. Within each block, three groups of six consecutive vines were randomly assigned as follows: (1) unmodified SPC control; (2) modification from SPC to SMPH 80; and (3) modification from SPC to SMPH 120. 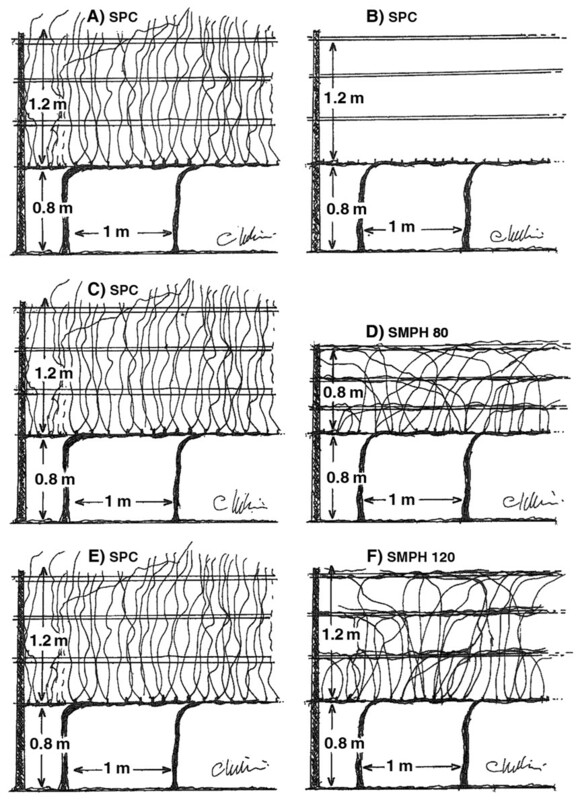 In winter 2002, the SPC control vines were traditionally spur-pruned (Figure 1A, B), while the SPC vines assigned to form the SMPH vines were pruned such that some of the canes from the preceding year were removed and the remaining intact canes were tied to the foliage wires to form 80 cm (Figure 1C, D) and 120 cm (Figure 1E, F) vertical hedge walls. The two extra rows of the vineyard were completely modified: one row was set at SMPH 80 and the second at SMPH 120 in order to evaluate mechanical harvesting. Schematic representation of the SPC control vines before and after pruning (A and B) and of the SPC vines converted to SMPH 80 (C and D) and to SMPH 120 (E and F). From 2003 to 2005, SPC control vines were manually pruned to retain 18 buds per meter of cordon, while the SMPH vines were mechanically pruned by a multiple cutter-bar machine operating on top and along the sides of the systems very close to the foliage wires to form and maintain the hedge profile. Data collection started in 2005, when the SMPH systems were well established, using the middle four vines in each replication. The two treated vines at both ends of each replication were considered as border vines. To overcome the practical difficulty of distinguishing the growth of one vine from the one next to it, the hedges were tagged with a vertical ribbon strips 1 meter apart along the rows and data were collected per meter of row length, each meter approximately corresponding to each vine (Figure 2). SMPH 120 vines completely shaped after 2005 winter mechanical pruning on top and along the sides of the system. To overcome the practical difficulty of distinguishing the growth of one vine from the next vine, ribbon strips were vertically stretched 1 meter apart along the row and data were collected as per meter of row length instead of per vine. The following parameters were recorded from 2005 to 2008: postwinter pruning bud number, without distinguishing between those on one-year-old main shoots or on laterals; budbreak of the retained buds; and shoot number and total leaf area per meter of row. Leaf area was logged yearly by collecting 10 representative shoots from the border vines following veraison of each replication of SPC, SMPH 80, and SMPH 120 and measuring the main and lateral leaf area per shoot with a LI-3000A area meter (LI-COR Biosciences, Lincoln, NE). The shoot leaf area was multiplied by the number of shoots per meter of each replication to provide a rough estimate of total leaf area per vine, according to published methods (Keller et al. 2004, 2005). From 2005 to 2008, just before harvest, two samples of 20 berries each per meter of tagged vine were randomly collected. One sample was used to assess must composition (Brix, pH, titratable acidity), while the second was processed to evaluate the skin-to-pulp ratio and total skin anthocyanins, based on a previous method (Mattivi et al. 2006). From 2005 to 2008, the data collected at harvest on each meter of tagged vine included fruitfulness, expressed as the number of clusters per shoot; total yield, cluster number, and weight; berry number per cluster and average berry weight; cluster compactness by OIV index (OIV 1993); and extent of bunch rot estimated as percent of cluster surface. Additional parameters, only recorded in 2006, were single-shoot growth (main and lateral length of 12 tagged shoots per replication were measured every two to three weeks from budbreak to mid-September) and total canopy light interception (measured on each replication by a 105 cm long, custom-built ceptometer equipped with 16 single cosine-corrected sensors at 7 cm spacing). The ceptometer was placed on a below-vine canopy grid of 2 m x 2 m to 20 locations per canopy, and the data recorded by a CR10 datalogger (Campbell Scientific, Logan, UT). The total incident light above the canopy was measured by a horizontal PAR sensor. Total light interception was calculated as 100 minus the estimated fractional light transmission to the ground. Light readings were recorded five times throughout the season, three times a day, 2 hr before solar noon, at solar noon, and 2 hr after solar noon on cloudless days. Single-leaf gas exchange was also measured in June, July, and August 2006 using a portable flow-through CIRAS-1 (PP System, Hertfordshire, UK). Readings were taken at an air flow of 300 mL and ambient relative humidity using a broad leaf chamber (2.5 cm2 window size). Leaf photosynthetic capacity was monitored at saturating light on every other main and lateral mature leaves inserted on six tagged shoots per replication of SPC and SMPH vines. The assimilation rate was calculated as μmol m−2 s−1 (CIRAS software, version 1.2). In 2008, the two extra rows of the vineyard, SMPH 80 and SMPH 120 trained, were mechanically harvested with a horizontal shaker unit. A combined analysis of variance over years after Gómez and Gómez (1984) was performed using the mixed general linear model procedure of SAS (SAS Institute, Cary, NC). Year was considered as a random variable, and the error term for the pruning treatments was the year-by-treatment interaction mean square. Mean separation between pruning levels was performed with the Student-Newman-Keuls test. The year-by-treatment interaction was tested over the pooled error and considered only if significant. Cluster compactness ratings and percentage of bunch rot were subjected to arc sine and square root transformation, respectively, prior to statistical analysis. Hand-pruned SPC vines had an average of 18 buds/m of cordon. The SMPH 80 and 120 had an average load of 332 and 479 buds/m of row over the four trial years (Table 1). As observed in several early minimal pruning trials (Clingeleffer 1988, Iacono et al. 1998, Poni et al. 2000, Intrieri et al. 2001), SMPH exhibited a physiologically self-regulating budburst, resulting in a 0.62 and 0.49 budburst rate on SMPH 80 and 120, respectively, compared to the 1.00 per node rate on SPC. As a result, the average shoot number per meter of row was 205 and 234 on SMPH 80 and 120, respectively, against 18 per meter of row on SPC control vines. In other words, the average SMPH shoot number was from 11-fold to 14-fold higher than SPC (Table 1). 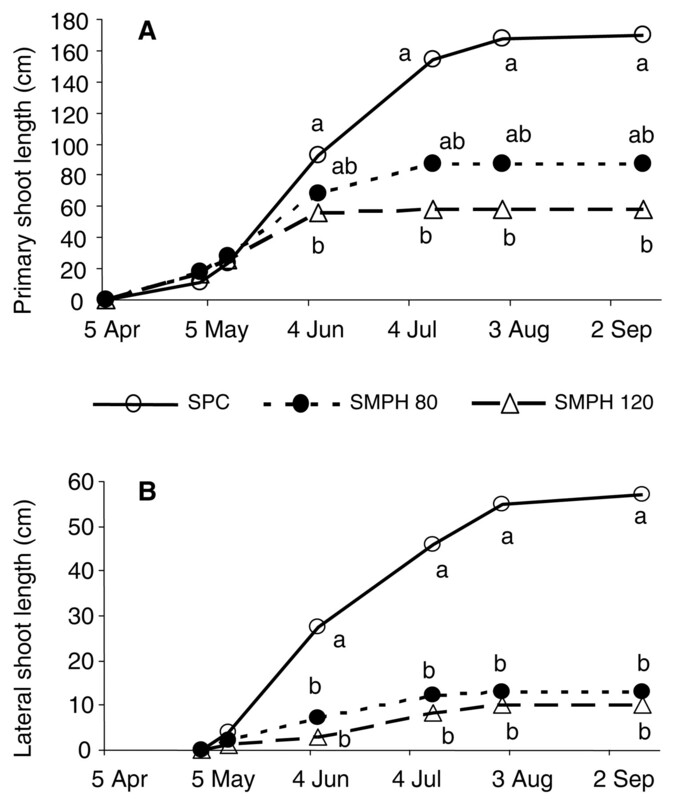 The higher shoot number on the SMPH treatments reduced the rate of growth measured during 2006 in single-tagged shoots, in which the main and lateral elongation after the end of July was practically nil (Figure 3). This finding agrees with the expected dwarfing effects usually seen when a very high shoot number is allowed and with the total main and lateral leaf area per sample shoot measured in SPC and SMPH over the four-year period. Accordingly, the average total leaf area/shoot on SMPH vines was ~450 cm2 compared with 2900 cm2 on control vines (Table 1). Nevertheless, the high shoot number of SMPH vines more than offset the reduced vigor of individual shoots, and the average total leaf area estimated per meter of cordon at the end of the four seasons almost doubled in SMPH treatments compared with SPC treatment. Our data thus agree with established principles (Winkler et al. 1974), according to which vine capacity varies directly with the number of shoots that develop. Overall, no significant year x treatment interactions were found on budload and vegetative development of SMPH and SPC vines (Table 1). Budload and vegetative canopy development for SMPH 80 and SMPH 120 as compared to SPC. Data averaged over 2005–2008. Seasonal variation of Sangiovese primary (A) and lateral (B) shoot length of SPC, SMPH 80, and SMPH 120 in 2006. At each date, different letters show significant differences at p ≤ 0.05. Gas exchange and light interception. Despite the large decrease in leaf area per shoot and the higher total canopy leaf area under SMPH vines compared to SPC (Table 1), differences of maximum CO2 assimilation rates on main and lateral mature leaves in selected shoots were not observed among treatments during late spring and summer of 2006 (Figure 4). Therefore, it can be assumed, at least in that year, a potentially higher overall photosynthetic capacity of SMPH during pre- and postveraison. This assumption is supported by the light interception measured during the same 2006 season (Figure 5). Light interception was higher in SMPH vines beginning approximately one month after budburst and reached a maximum of 50% of incoming light in mid-July, when light interception of control vines was ~35% (Figure 5). While maximum light interception of control vines (40%) was reached in mid-September, no further increase was found in SMPH vines, a result in agreement with the reduced shoot elongation after July and corresponding to reported data on minimal pruning (Intrieri et al. 2001). 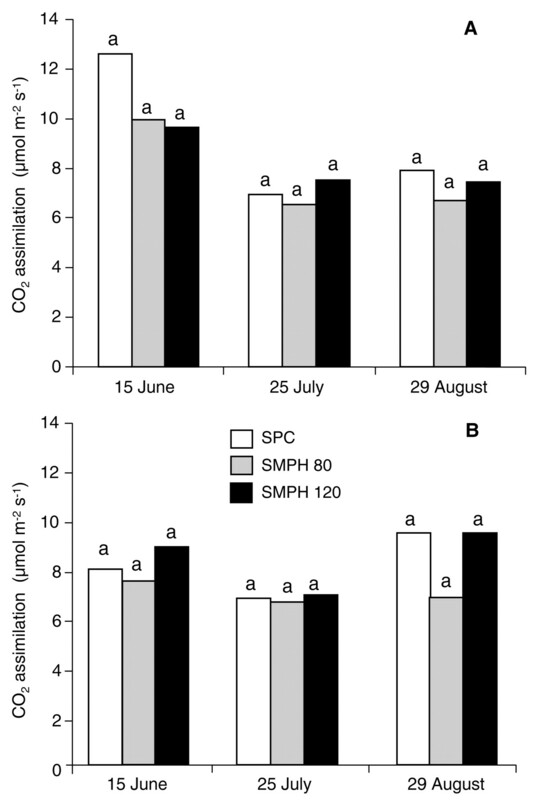 The main physiological implication of this effect is that the potentially higher SMPH assimilation likely began earlier compared with SPC and remained greater in the latter part of the season. Average of leaf assimilation rate for primary (A) and lateral (B) shoot leaves recorded at three dates in 2006 for SPC, SMPH 80, and SMPH 120 treatments. Readings were taken on every other leaf at saturating light on six tagged shoots per replication. Data are not significantly different among treatments. 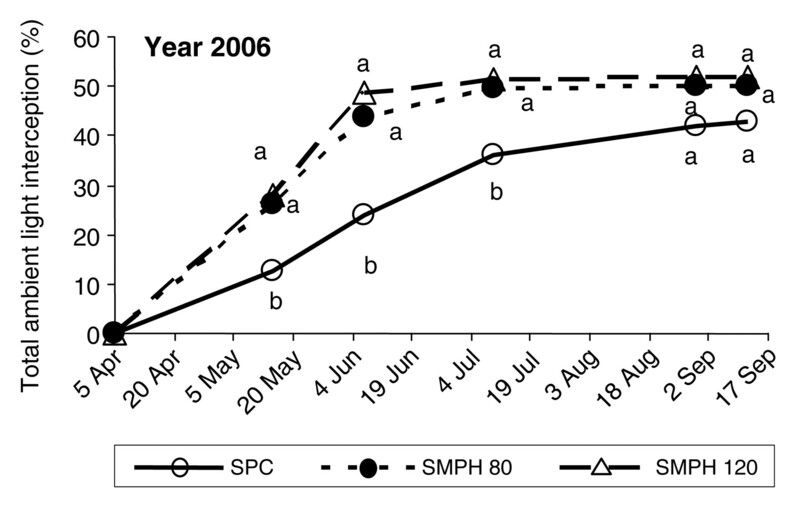 Seasonal variation of percent light interception of Sangiovese canopy SPC, SMPH 80, and SMPH 120 in 2006. At each date different letters show significant differences at p ≤ 0.05. Yield, yield components, and cluster characteristics. The normally high fertility rate of Sangiovese dropped to 0.27 and 0.30 clusters per shoot in SMPH 80 and 120, respectively, against 1.22 clusters in the SPC control (Table 2). The self-regulatory mechanism of lightly pruned vines was involved, as shown by other trials on full mechanical pruning with no hand follow-up (Intrieri et al. 1988) and on minimal pruning in different environments (Freeman et al. 1979, Clingeleffer and Possingham 1987, Possingham 1994, 1996, Iacono et al. 1988, Poni et al. 2000, Intrieri et al. 2001). The average number of clusters per meter of row length was only three to four times higher in SMPH than in SPC (Table 2). SMPH clusters also weighed less than typical for Sangiovese because berries were smaller and fewer. Thus, although SMPH 80 and 120 had three to four times the average number of clusters per meter as SPC, the average yield per meter of SMPH 80 and 120 was only 35 to 40% higher than SPC. However, a year x treatment interaction on cluster number and yield was found, showing a tendency to alternate bearing and an effect that was more limited in SMPH 80 than in SMPH 120 compared with SPC (Figure 6). The overall result is an average crop of 7.9 kg/m of hedge wall in SMPH 80 against 5.8 kg/m in SPC and 8.3 kg/m in SMPH 120, a result that is even more evident compared with our past trial with minimal pruning (Intrieri et al. 2001) and when viewed in the light of a basic physiological concept applied to pruning (Winkler et al. 1974). SMPH clusters were also less compact than SPC clusters and appeared less susceptible to botrytis attack (Table 2), effects also reported in most of the other minimal pruning trials cited above. Yield components and cluster traits for SMPH 80 and SMPH 120 as compared to SPC. Data averaged over 2005–2008. 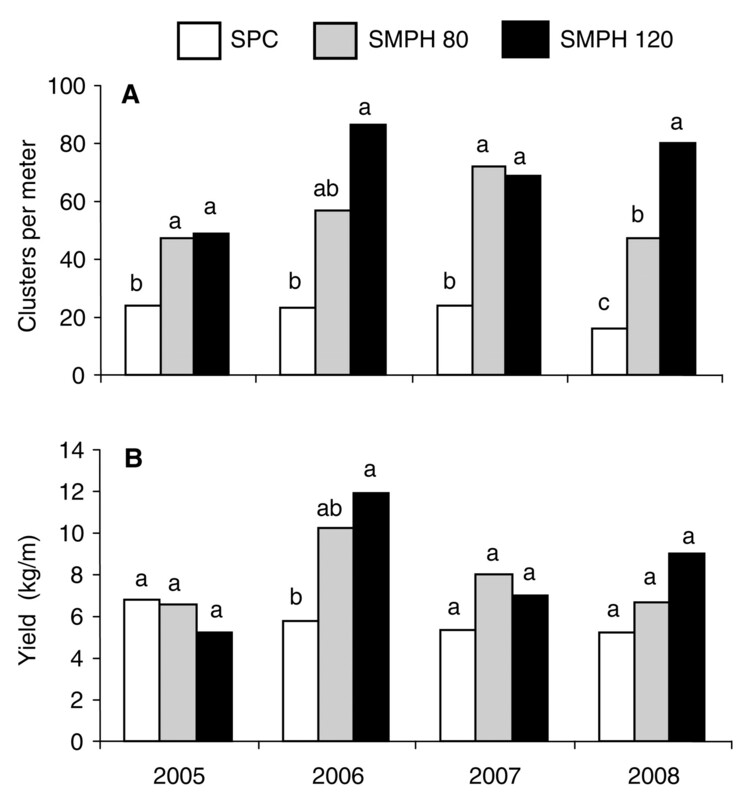 Average variation over years of cluster number (A) and yield (B) per meter of hedge in SPC, SMPH 80, and SMPH 120. At each year, different letters show significant differences at p ≤ 0.05. Must composition, total anthocyanins, and berry traits. Despite higher SMPH cropping (Table 2), the soluble solids (Brix), titratable acidity, and must pH at harvest of SMPH 80 and 120 and control vines did not differ throughout the trial (Table 3). These results are consistent with the higher total leaf area and higher leaf-to-fruit ratio (m2/kg) averaged over the four trial years (Table 1) and with the identical photosynthetic capacity of adult leaves of SMPH vines recorded in 2006 (Figure 4). Total anthocyanin concentration, expressed either as mg/g of skin or mg/k of grape, showed higher values in SMPH treatments compared to the control, but the differences were significant only in SMPH 120 (Table 3). Because of the smaller SMPH berry size (Table 2), skin weight per berry was also lower in both SMPH treatments and no differences were found in skin/berry ratio among treatments (Table 3). These results suggest that the higher anthocyanin concentration in SMPH grapes may be partially due to their smaller berry size but mainly due to a direct effect on anthocyanin biosynthesis, as shown by the higher level of anthocyanin per gram of skin (Table 3), and may be linked to the greater light interception and higher leaf area for the SMPH treatments (Figure 5, Table 1). The greater light interception and higher leaf area of SMPH may have increased SMPH total canopy water loss in our unirrigated vines, thereby resulting in a reduced water supply for the berries. As underscored by other researchers, anthocyanin biosynthesis normally increases after water stress (Roby et al. 2004). Must composition, total anthocyanins, and skin to berry ratio for SMPH 80 and SMPH 120 as compared to SPC. Data averaged over 2005–2008. SMPH aptitude for mechanical harvest. The two SMPH rows adjacent to the trial vines were harvested in 2008 using an overrow horizontal shaker. Although no specific harvest data were collected, visual observations indicated that the harvest unit had no trouble detaching grapes arrayed along the hedge walls. Results indicate that the SMPH regimes in Sangiovese grapevines had earlier leaf area development, higher leaf area-to-yield ratio, and greater overall assimilation with higher cropping than SPC. It was also notable that SMPH clusters were smaller and looser than SPC clusters and, hence, proved to be less susceptible to botrytis-induced rot, a particular problem in conventionally trained Sangiovese. Indeed, SMPH grapes showed no ripening delay and their biochemical properties did not differ significantly from SPC grapes at harvest, although there was a tendency toward an increase in anthocyanin concentration in SMPH berries. The SMPH vines can thus effectively address the drawbacks attached to minimal pruning with medium-to-late season ripeners like cv. Sangiovese. SMPH 80 had fewer buds per meter of row and was less prone to alternate bearing compared with SMPH 120 vines, while still producing 30% greater yield than the control. The SMPH 80 yielding capacity can be eventually reduced with further adjustment of pruning severity, by reducing the length of the mechanical cuts on the sides of the hedgerow and, hence, the number of buds left on the vines. It is not difficult to complete the vine frame for SMPH, and winter pruning operations are rapid. Even summer operations could be performed just as efficiently to eliminate excess shoot growth in very fertile soils. Shaker-head harvesting was also easily conducted. SMPH appears to be worthy of practical application because of its reduced management cost, adaptability to full mechanization, and improved yield and quality. Revision received March 1, 2011.
. 2004. Viticoltura meccanizzata. Ed. Edagricole, Bologna.
. 1991. Bilan de résultats d’analyse sensorielle de la qualité des vins de divers systèmes de conduite. In Compte Rendu n° 5 du Groupe Européen d’étude des Systèmes de Conduite de la Vigne. Istituto Sperimentale di Conegliano (ed. ), pp. 334–334. Conegliano, Italy. 1983. Minimal pruning–Its role in canopy management and implications of its use for the wine industry. In Advances in Viticulture and Oenology for Economic Gain. Proceedings of the 5th Australian Wine Industry Technical Conference. Lee, T.H., and T.C. Somers. (eds. ), pp. 133–145. AWRI, Glen Osmond. 1984. Production and growth of minimally pruned Sultana vines. Vitis 23:42–54. 1988. Minimal pruning of cordon trained vines (MPCT). In Proceedings of the Second International Seminar on Mechanical Pruning of Vineyards, pp. 112–120. Villanova di Motta di Livenza, Treviso, Italy. Edagricole, Bologna. 1993. Development of management systems for low cost high quality wine production and vigour control in cool climate Australian vineyards. Aust. Grapegr. Winemaker 358:43–48. 2009a. Integrated vine management to minimise the impacts of seasonal variability on yield, fruit composition and wine quality. In Proceedings of the 16th International GiESCO Symposium. Wolpert, J.A. (ed. ), pp. 259–264. University of California, Davis. 2009b. Influence of canopy management systems on vine productivity and fruit composition. In Recent Advances in Grapevine Canopy Management, pp. 13–18. University of California, Davis.
. 1987. The role of minimal pruning of cordon trained vines (MPCT) in canopy management and its adoption in Australian viticulture. Aust. Grapegr. Winemaker 280:7–11.
. 1979. Interaction of irrigation and pruning level on growth and yield of Shiraz vines. Am. J. Enol. Vitic. 30:218–223.
. 1984. Statistical Procedures for Agricultural Research. Wiley & Sons, Singapore.
. 1998. Prime esperienze di potatura minima in clima caldo-arido sulla varietà Chardonnay: Sviluppo della chioma, attività di fotosintesi e risultati quanti-qualitativi. Italus Hortus 3:3–10.
. 2001. Planting density and physiological balance: Comparing approaches to European viticulture in the 21st century. In Proceedings of the ASEV 50th Anniversary Annual Meeting. Rantz, J.M. (ed. ), pp. 296–308. ASEV, Davis.
. 2001. Vine performance and leaf physiology of conventionally and minimally pruned Sangiovese grapevines. Vitis 40:123–130.
. 1988. Long term trials on winter mechanical pruning of grapes. In Proceedings of the Second International Seminar on Mechanical Pruning of Vineyards, pp. 168–178. Villanova di Motta di Livenza, Treviso, Italy. Edagricole, Bologna.
. 2004. Crop load management in Concord grapes using different pruning techniques. Am. J. Enol. Vitic. 55:35–50.
. 2005. Cluster thinning effects on three deficit-irrigated Vitis vinifera cultivars. Am. J. Enol. Vitic. 56:91–103.
. 1998. Long-term effects of zero pruning on Grenache vines under drought conditions. Vitis 37:155–157.
. 2006. Metabolite profiling of grape: Flavonols and anthocyanins. J. Agric. Food Chem. 54:7692–7702. OIV (Office International de la Vigne et du Vin). 1993. Code des caractères descriptifs des variétés et espèces de Vitis. OIV, Paris.
. 1993. Quelques résultats sur la taille minimale en Australie et France. In Compte Rendue n° 6 du Groupe Européen d’étude des Systèmes de Conduite de la Vigne. Perrier-Jouet, Mumm (ed. ), pp. 181–183. Reims, France.
. 2006. Crop thinning (hand versus mechanical), grape maturity and anthocyanin concentration: Outcomes from irrigated Cabernet Sauvignon (Vitis vinifera L.) in warm climate. Aust. J. Grape Wine Res. 12:21–29.
. 2003. Mechanical thinning to stabilise yield and improve grape maturity and colour. Aust. N.Z. Grapegr. Winemaker 473:118–120.
. 2000. Seasonal growth and gas-exchange of conventionally and minimally pruned Chardonnay canopies. Vitis 39:13–18.
. 1993. Predicting and controlling crop of machine or minimal pruned grapevines. In Proceedings of the Second N.J. Shaulis Grape Symposium on Pruning Mechanization and Crop Control. Pool, R.M. (ed. ), pp. 31–45. New York State Agricultural Experiment Station, Geneva. 1994. New concepts in pruning grape vines. Hortic. Rev. 16:235–254. 1996. Factors affecting the quality of wine from minimally pruned grapevines. Acta Hortic. 427:387–393.
. 1999. Distribution of glycosides, including flavour precursors in berries from minimal pruned (MP) and vertical shoot positioned grapevines (VSP). In Compte Rendue n° 11 du Groupe Européen d’étude des Systèmes de Conduite de la Vigne. Università degli Studi di Palermo (ed. ), pp. 271–279. Marsala, Italy.
. 1993. Comparison of leaf area development, leaf physiology, berry maturation, juice quality and fruit yield of minimal and cane pruned Cabernet Sauvignon grapevines. In Proceedings of the Second N.J. Shaulis Grape Symposium on Pruning Mechanization and Crop Control. Pool, R.M. (ed. ), pp. 14–19. New York State Agricultural Experiment Station, Geneva.
. 2004. Berry size and vine water deficits as factors in winegrape composition: Anthocyanins and tannins. Aust. J. Grape Wine Res. 10:100–107.
. 1974. General Viticulture. University of California Press, Berkeley.